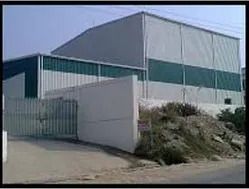 Established in the year of 2009, we "Paramount Tech Fab Industries", established ourselves as a prominent organization of the market by manufacturing and supplying a wide array of Fabric Products. Under our quality approved the collection of products we are presenting Hygiene Fabric, Spunlace Fabric and Shoes Cover Fabric. Offered products are designed from high-grade fabric with following industry norms and standards. Our offered products are highly admired by the customers for their shrinkage resistance, fine finish, perfect stitch, stylish looks and longer life. Apart from this, one can avail these products within the limited period of time. Also, this assortment is used in Hospitals, Packaging, Food, Shoe Industries, Agriculture, Rice & Pulses Industries and Carpet Manufacturing. We have constructed a highly advanced and well-equipped infrastructure unit. Our manufacturing unit is full with all the required machines and tools. Also, we have hired a team of qualified professionals to handle all our business operations. We have recruited our team of professionals after assessing their previous working experiences and domain knowledge. We are able to deliver the products on time and safely at client premises with the help of our well-connected distribution network. Under the direction of our mentor "Mr. Jahangir", we are able to famous in the market. Owing to his vast knowledge, we are increasing our reach across the nation. We are backed by top-notch infrastructure. Our manufacturing unit is equipped with all the updated tool, machines and latest technology for the production of this non-woven fabric. This facility is regularly checked in order to match the current needs of the market. We are able to deliver the products on time and safely at client premises with the help of our well-connected distribution network. We also understand the quality of our product is important not only for us but for the client competitiveness as well. We are supported by a talented team of designers that makes every possible effort to meet the high expectations of our valued clients. They make sure that all the offered fabrics is in compliance with industry standards of quality, properly packed and then dispatch at the customers end within the committed time frame. Our offered fabrics are highly admired by the customers for their attractive designs and excellent finishing standards. With years of experience in this industry, we know what our customers are looking for. Our ethical business practices and transparent dealings have made us the preferred choice of our clients. 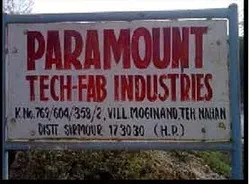 Paramount has imported technology from China and is now gaining more popularity as a brand. We source our material from authentic suppliers and test then on various parameters before use. The entire production process is carried in our state of art production unit, and each stage is managed continually by our team of quality control experts. If your business requires any of our product range, please feel free to contact for enquiries. We have a 3.2m single beam PP spunbond line from Shaoyang China. Shaoyang Textile Machinery Works is a group company of CTMC. Shaoyang has acquired international repute as supplier of extruders and melt spinning equipment to renowned companies like Reliance and Chemtex. 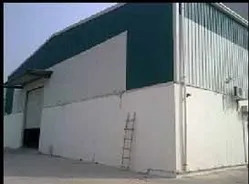 As a result of this experience the fabric from the spunbond process is of very high and meets the most stringent standards.All energies are concentrated towards producing Pollution free non woven fabrics to our customers' satisfaction. Complete process controls with quality checks at each stage of Operation from unloading to raw material to delivery of goods. To cooperate with our customer and provide innovative solutions. To provide Quality products consistently and build up customer relations.